I love potatoes. They are one of the most versatile foods out there. I can think of dozens of way to prepare them. I feel like Bubba from Forest Gump talking about shrip! Here’s a new way I found to fix red potatoes and I’ll talk you why I love it! Smashed Red Potatoes! First off this recipe is easy. I’m not even sure I would classify this as a recipe, it’s more of a how to. Red potatoes are my favorite potato to work with. I think I like them the most because I don’t mind eating the skin and that save me the work of peeling…which I hate peeling potatoes! I also love how you can dress these up to your liking. Keep it simple with salt and pepper or add some more seasonings and cheese. My kids like to help make these Smashed Potatoes. They are in charge of the smashing part, the best part! I find that any time my kids get involved with helping make it they are more likely to eat it! I like the texture of these smashes potatoes. I’m really picky when it comes to the texture of my food…a little strange I know! I love a crispy crunchy texture. These potatoes have the prefect combination of soft fluffy potato inside and a nice crunchiness on the outside edges. 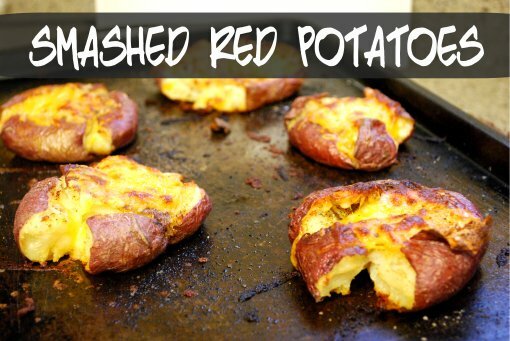 Next time you are looking for a new side for you meal try these Smashed Red Potatoes! The family is sure to love them! You will need smaller red potatoes, olive oil, salt and pepper. You can also add cheese, butter, minced garlic and your favorite seasonings. Boil potatoes for about 20 min until fork tender. Drain. Spray a cookie sheet with oil or rub with olive oil. Place the potatoes on the sheet and spread about 2-3 inches apart. Press down on them with the bottom of a glass to smash them.